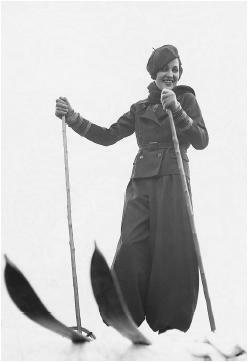 Skiwear design by Jean Patou, ca. 1930. 1925; introduced Princess line, 1929; brother-in-law, Raymond Barbas, took over business on death of Patou, 1936; Parfums Patou established in London, Milan, Geneva, Hong Kong, and Australia, by 1982; designers for the house have included Bohan (1954-56), Lagerfeld (1960-63), Gaultier (1971-73), Goma (1963-73), Tarlazzi (1973-77), Gonzalés (1977-82), and Lacroix (1982-87); signed licensing deal with Yohji Yamamoto for fragances, 1994; fragrances include: Amour Amour , que sais-je , Adieu Sagesse , 1925; Chaldée, 1927; Moment Suprême, 1929; Joy, 1930; Divine Folie, 1933; Normandie, 1935; Vacances, 1936; Colony, 1938; l'Heure Attendue, 1946; Caline, 1964; 1000 de Jean Patou, 1972; Eau de Patou, 1976; Patou pour Homme, 1980; Sublime, 1992; Prive, 1994; Quasar, 1995; Yohji, 1996; Yohji Essential and Patou for Ever, 1998; Yohji Homme, 1999; Nacre, 2001. Awards: Scent of the Century ( Joy ), 2000. Company Address: 7 rue St. Florentin, Paris, 75008 France. Etherington-Smith, Meredith, Patou, London, 1983. McDowell, Colin, McDowell's Directory of Twentieth Century Fashion, Englewood Cliffs, NJ, 1985. Ewing, Elizabeth, History of Twentieth Century Fashion, Totowa, NJ, 1986. "Patou with a New Spirit," in Vogue, May 1985. Donovan, Carrie, "The Two Sides of Paris Couture," in the New York Times Magazine, 23 February 1986. Everett, Patty, "After Half a Century, Joy Adds Bath, Body Line," in WWD, 9 January 1987. Koselka, Rita, "Affordable Luxury," in Forbes, 4 May 1987. "Patou Judgement Goes Against Gaultier," in WWD, 30 November 1994. "Vive l'Amour," in WWD, 13 March 1998. Ozzard, Janet, "May Debut for Yohji Homme (Patou's New Men's Fragrance)," in WWD, 2 April 1999. "Great Joy for Patou— Joy, Scent of the Century," in Soap Perfumery & Cosmetics, September 2000. Born, Pete, "Newest Pearl in Patou's Crown," in WWD, 23 February 2001. Since its origin, the House of Jean Patou has always associated fashion (1919) and perfumery (1925) activities. I think there are numerous similarities in the care given to these two industries, notably in the domaine of know-how, innovation, the constant research for quality and in the intervention of a highly qualified workforce. Forever the forerunner, Jean Patou has always understood the tastes and aspirations of his contemporaries. Whilst he was the primary influence in women's sportswear and creator of the first knitted bathing-suits, he was also the first couturier to use his monogram as a design feature. For Jean Patou, "the modern woman leads an active life, and the creator must therefore dress her accordingly, in the most simple way, whilst maintaining her charm and femininity." It is in this sense that the stylists that have succeeded Jean Patou have worked. They have created original and striking collections, with no limits, maintaining the label's prestigious aura, its liberty and quality. I think that fashion should reflect a woman's desires, should not constrain her but allow her to live with her epoch. Fashion history records that Jean Patou is best known for Joy, the world's most expensive perfume, and for his famous cubist sweaters. His contributions to fashion were, however, much more substantial and far reaching. His genius was his ability to interpret the times in which he lived and translate the ideals of that era into fashion. In Paris during the 1920s, couture was evolving from serving a few wealthy clients into a huge autonomous industry and Patou recognized couture's tremendous potential, both in France and in the United States. Patou helped expand the industry by introducing sportswear, expanding his business into the American market, emphasizing accessories and, like Paul Poiret, offering his customers a signature perfume. The 1920s ideal woman was youthful, physically fit, and healthy looking. The truly athletic woman was realized in Suzanne Lenglen, the 1921 Wimbledon tennis star, who wore Patou clothes both on and off the court. The benefits gained by the sports stars and other celebrities publicizing Patou's designs were many. Patou also provided a complete wardrobe for American female aviator, Ruth Elder, as well as many well-known stage stars. Patou customers, most of whom did not play sports, sought to emulate this new look. Patou recognized the need for clothes for the sports participant, the spectator, and for those wishing to appear athletic, both in the U.S. and in Europe. In 1925 he opened a Paris boutique called Le Coin des Sports where he devoted a series of rooms each to an individual sport. Complete accessorized outfits were available for aviation, riding, fishing, tennis, golf, and yachting, among others. Also recognizing the importance of leisure and travel to his customers, Patou opened salons in the resort areas, Deauville and Biarritz, where off-the-rack items such as sweater sets, swimsuits, and accessories were available. After expanding his business in France, Patou realized the potential for the fashion industry in the U.S. and admired the long, lean lines of the American silhouette. In 1925 he traveled to New York and hired six women to return to Paris with him and work as mannequins. This well-publicized action made the couture more accessible to Americans, improving his overall market share and profits. The French sought to emulate this silhouette as well, making Patou one of the best-known names in fashion. Patou's design philosophy was influenced by sportswear, continuing the theme of casual elegance into day and evening ensembles. He believed in beautiful but functional clothes which reflected the personality of the wearer. Patou never felt fashion should dictate; the cut of the clothes was simple, often accented with architectural seam lines, embroidery detail, and attention to fabric, trims, and finishings. By collaborating with textile mills on design and color, Patou was able to create exclusive colors through thread-dyeing methods, eliminating exact copies by lesser competitors. Patou also developed a swimsuit fabric which resisted shrinkage and fading, pleasing both swimmer and sun worshipper. Design inspirations included Russian embroideries, antique textiles, and modern art. By interpreting the surrounding art movements and cultural ideas into his designs, Patou created such classics as "cubist" sweaters, which figured prominently in his business. By adding coordinating skirts, scarves, hats, and other accessories, he increased his overall sales. Patou revolutionized the knitting industry with machine production, which meant greater productivity and greater profits. The casual fit of sweater and sportswear, in general, was financially beneficial as it required fewer fittings and less overall production time. Patou also applied his own monogram to his sportswear designs—the first visible designer label (and over which the company later went to court with Jean-Paul Gaultier, suing the former in-house designer for a logo too closely resembling Patou's renowned initials). The legendary rivalry between Patou and Chanel was intense and perhaps fueled both of their successful careers. Their visions for the modern woman were quite similar, and although it is Chanel that fashion history has credited with many of the silhouette and conceptual changes of 1920s fashions, it was Patou who, in 1929, dropped the hemline and raised the waistline—Chanel quickly followed suit. The House of Patou prospered during the Depression but Patou himself was unable to interpret the 1930s as he had so successfully captured the 1920s. He died in 1936, a relatively young man. While Patou had demonstrated a brilliant business sense, ultimately undermined by his destructive gambling tendencies, the company stayed in family hands and remains world renowned today. Just as it had in the later years of the 20th century, Jean Patou in the 21st century revolved around an increasing stable of fragrances for men and women. Unlike many firms who contracted out, Jean Patou had not one but two fulltime perfumers on its premises as of 1998. In addition to creating its own fragrances, licensing deals to distribute Hubigant's Quelques Fleurs, and to develop and sell Yohji Yamamoto's fragrance line have kept Jean Patou at the forefront of the industry. The new millenium brought further exposure and accolades for Jean Patou. Yamamoto's first two fragrances had proven successful enough for a third, and perennial bestseller Joy was named the "Scent of the Century" in 2000, beating out longtime rivals such as Chanel No. 5 and Anaïs Anaïs for the honor, which was sponsored by the UK's Fifi awards. Capitalizing on its higher profile, Jean Patou launched two new women's fragrances, Lacoste in 2000 and Nacre in 2001. The first was unveiled in Azerbaijan, and second, meaning mother of pearl in French, harked back to a dress called the "Fleur de Nacre," which debuted in spring 1922.